Runners always come in pairs, so grab a friend and come to the first Sun Run clinic next Wednesday at the New West Campus! Find out more about how you can get hands-on experience at the ‘Happiest Place on Earth’: the Walt Disney World Resort in Orlando, Florida. Disney and the University of California will be on both campuses on Monday, March 8. NOTE: Students from all faculties are encouraged to attend the info sessions on March 8. Currently, the internship is open to Commerce and Business Administration students only, but the college would like everyone to come along so it can gauge demand and adapt the program as needed. Business students (except HORM) need to fill out a pre-screening application form - information and the form can be picked up at the Commerce and Business Field Base, room 4300 at the New West Campus or room A3030 at the David Lam Campus. Submit completed forms and documentation in hard copy by Tuesday, March 2 to the Commerce and Business Administration team at either campus. The Semester 6 Bachelor of Science in Nursing Students (BSN) would like to thank everyone who donated money on Toonie Tuesday on February 2 at both Douglas College campuses. help, which the Federal government will be matching. The donations collected have been sent to the Red Cross Haiti Earthquake Relief Fund. The faculty member from the BSN program who helped us organize this was Roberta Mercier. Thank you all once again for your donations! 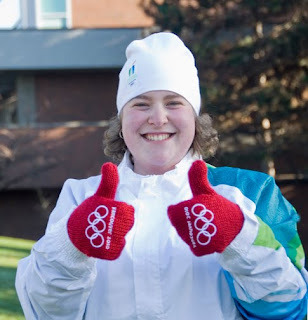 Without the encouragement of one of her instructors at Douglas College, Anna Solnickova would never have applied to be the College Olympic torch bearer. “George Fisher urged me to apply – I really owe this to him,” says Anna, now in her final semester of the Bachelor of Business Administration (BBA) - Accounting program. When an email went around the College asking for nominees for a torch bearer, George says he immediately thought of Anna. “I see a lot of really good qualities in Anna both inside and outside of the classroom that exemplify the Olympic spirit, namely determination and courage,” says George. Anna plans to draw inspiration from Terry Fox. At 17, she was diagnosed with osteosarcoma in her right knee. Having immigrated to Canada from the Czech Republic at age 13, she had learned about Terry Fox in an ESL class, but hadn’t quite grasped his importance in Canadian history. When she was diagnosed with the same cancer as Terry, her boyfriend (now her husband) told her more about him. “Terry Fox was my main motivation to get through it. It was scary how identical our stories were. I was 17 when I was diagnosed, he was 18. It was the same cancer in the same location. His selflessness saved my leg and saved my life. Without his work, I probably wouldn’t be here talking to you today,” says Anna. In 2005, she was diagnosed with sarcoma in her lungs – the same cancer that Terry Fox died from. It was at that point that she contacted Terry’s brother, Darryl, and got involved with the Terry Fox Foundation. After treatment, which included removing half of one of her lungs and chemotherapy, Anna says it was time to decide what she wanted to do with her life. Her mother is an accountant, so she chose the Accounting Program at Douglas, then transferred to the BBA Program. She says the instructors make all the difference in the program. George Fisher, Don Valeri and Bill Archibald “really care about their students’ success in and out of the classroom,” Anna notes, adding that she counts them all as friends and mentors. Anna recalls the first time she told George she was involved with the Terry Fox Run, he immediately opened his wallet and handed her $100. “Each year he increases his donation. This year, he may be up to $1,000,” she laughs. 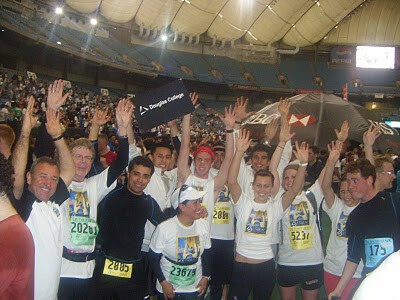 With the encouragement of her friends at Douglas and with Terry Fox’s determination in mind, Anna is ecstatic to play a role in the 2010 Olympic Games. My name is Priscilla and I am the External Relations Coordinator for the Douglas Students' Union. I had initially sent an email about our match funding groups who wanted to fundraise for the relief efforts for Haiti. "The DSU is committed to making every effort to raise funds for Haiti. Our primary fundraiser will be a bake sale held in the concourse on January 28. DSU will match funds collected by DSU though direct fund raising or clubs to a total maximum of $500before January 29, 2009 and requires the funds to be sent though DSU to a legitimate aid organization. 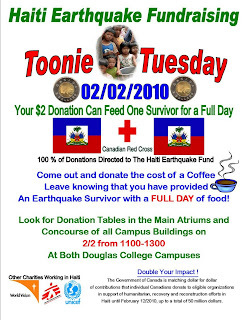 DSU will also be making an up front contribution of $500 to Haiti aid." The DSU believes in supporting the efforts put forward for this cause and are doing their best to rectify any problems because of this error. I thank you for the moment of your time, I wanted to apologize for any inconvenience. Think you’re healthy? The Douglas College SWAT (Student Wellness Awareness Team) wants you to come out to the Health and Wellness Fair on Tuesday, February 2 in the David Lam atrium and Wednesday, February 3 in the New West concourse, from 10:00am-2:00pm both days. Make your way through several interactive booths at the Health and Wellness Fair, including a massage therapist, chiropractor, a naturopathic doctor, the Sport Science, Nursing and Therapeutic Recreation departments, DC Recreation, and many more! Sample some free snacks and enter to win Canucks tickets and other awesome student health and wellness-related prizes! The fair will also include a fundraising booth organized by Health Sciences students for the Canadian Red Cross's disaster relief in Haiti. Donations over $10.00 will receive a tax receipt.